The Protect-A-Bed® Allerzip Smooth Pillow Protector are designed for allergy sufferers to provide a protective barrier against dust mites, bacteria and other allergens. The pillow covers are air vapor porous and waterproof which help to prevent stains and are absorbent. 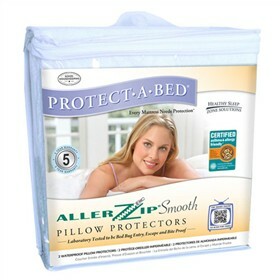 Protect-A-Bed® AllerZip pillow protectors are cool and comfortable to sleep on. The Protect-A-Bed Allerzip Pillow Protector Standard Size has many exciting features for users of all types. See the Protect-A-Bed Allerzip Pillow Protector Standard Size product video and gallery images above for more details. The Protect-A-Bed Allerzip Pillow Protector Standard Size is sold as a Brand New Unopened Item.